After checking out the Sun Voyager sculpture, I went back to Kex Hostel - Reykjavik - Iceland to wait for my tour bus. 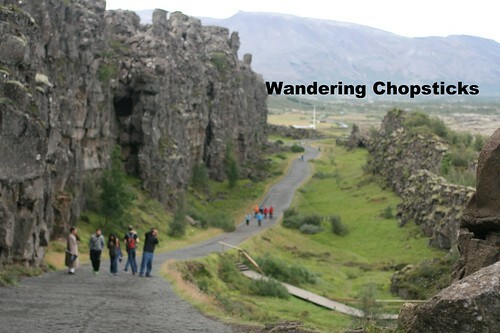 The most popular tour in Iceland is the Golden Circle, which includes visits to Thingvellir National Park, Gullfoss (Golden Waterfall), and the Great Geysir and nearby geysers. The afternoon or day tours also included stops at a church and a geothermal plant, but honestly, all I really wanted to do was stand in the middle of the Mid-Atlantic Ridge and see the original Geysir, from which all geysers got their name. I just happened to get into town on the very last day of the evening tour, which picked up at 6:30 p.m. and didn't end until midnight. Midnight! Because being that far north in the summer meant it didn't get dark until then. Cool, eh? The evening tour, which cost 8,500 Icelandic krona ($71 USD), also worked out great because it allowed me to squeeze in a visit to the Blue Lagoon - Grindavik - Iceland in the morning and left my second day free. After being picked up from the hostel in a van, we were taken to the ticket office where I had to line up to get a ticket for the tour, then finally we were on our way. We arrived at Thingvellir National Park a little before 8 p.m. Look how bright it still was. 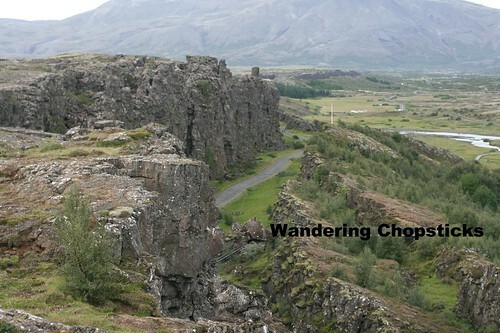 Actually, Thingvellir is written like this Þingvellir in Icelandic. 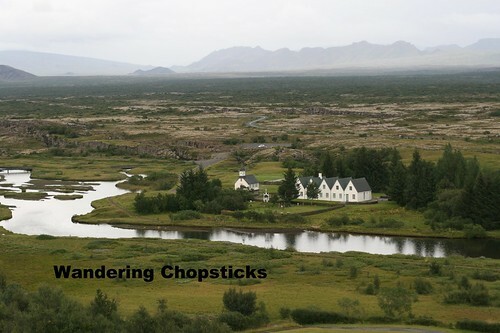 Þing means fields, and the Alþingi (Icelandic all-assembly or parliament) was founded in the year 930 on this site and used until 1789. 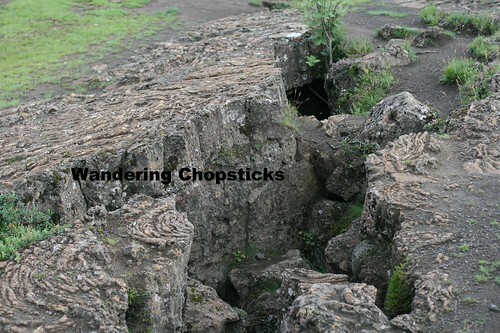 The park was formed in 1930 to preserve the historical area and also to protect the rift valley. 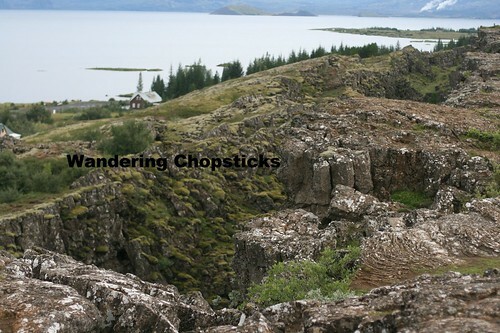 The Mid-Atlantic Ridge cuts right through Thingvellir National Park. 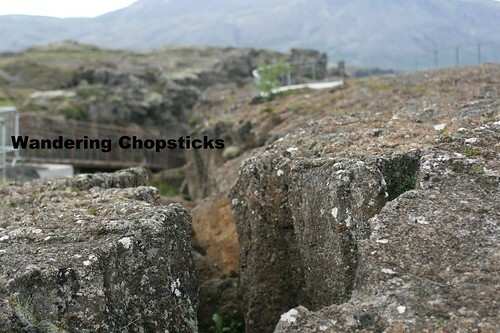 The North American and Eurasian plates are separating at a rate of 2.5 centimeters or nearly an inch a year! Plate tectonics yo! I couldn't think of anything cooler than standing in the middle of two plates as they pulled each other apart year after year. The same forces that split South America and Africa apart hundreds of millions of years ago and I got to stand smack dab in the middle of it all! It's crazy to see geology so active! The earth constantly pulling apart. The white buildings are the site of the Althingi. 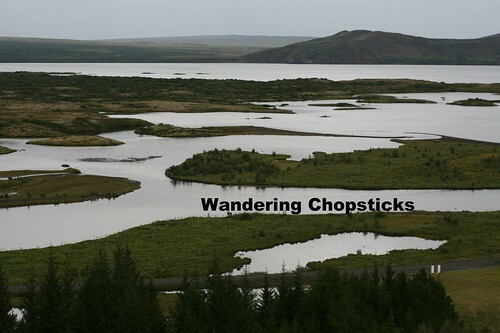 Þingvallavatn, is the largest natural lake in Iceland. True story. To fulfill my science requirements in college, I took geology and plate tectonics classes. So the rock nerd in me was loving seeing all this in person. Descending into the rift valley so I could take a picture in the middle of the Mid-Atlantic Ridge. 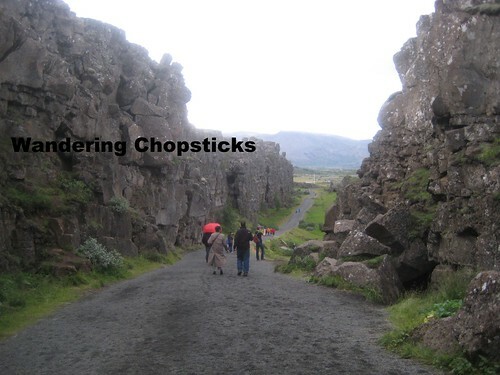 Thingvellir, as well as the Golden Circle sites of Gullfoss and Great Geysir, were featured in the first episode of Season Four of "Game of Thrones." 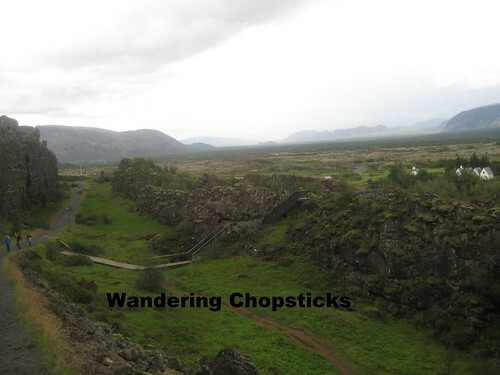 North American Plate on one side, Eurasian Plate on the other. The other benefit to the evening tour was that it was just us and one other tour group. I've seen pictures where people were literally lining up to walk because it was so crowded. You can see the assembly site on the far right of the photo below. But since we were trying to visit all the sites before dark, we didn't have time to walk over. 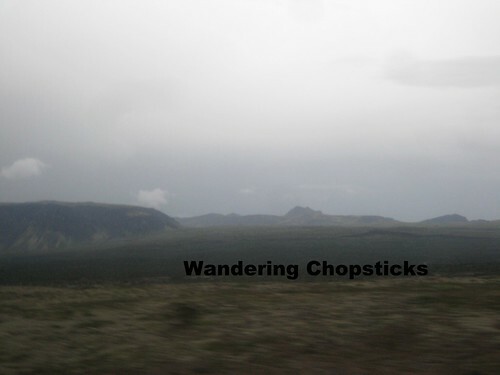 If you look on the far right of the photo below, right above where I slapped on my watermark, you can see a black ridge of land pushing up. Perhaps some day, it'll be a cliff or mountain. The tour guide kept saying Iceland is being torn apart by the Mid-Atlantic Ridge. But there's plenty of magma below pushing the land up, so wouldn't it actually be making Iceland bigger? As if any of us will still be around in another hundred million years to know the answer! 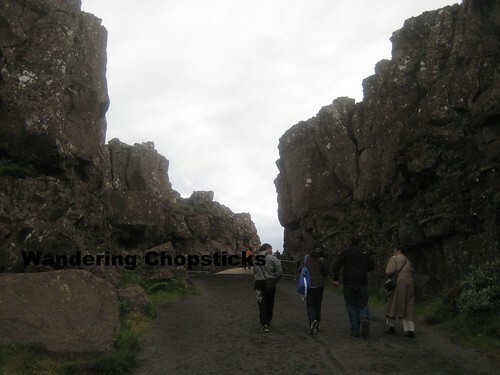 I did the evening Golden Circle Tour from Iceland Excursions Gray Line Iceland for 8,500 Icelandic krona ($71 USD), which included this visit to Thingvellir National Park, as well as Gullfoss and the Great Geysir. There's a 5% discount if you book in advance online. 1 year ago today, Chinese Sauteed Lettuce with Oyster Sauce. 2 years ago today, Cinespia Cemetery Screenings - Hollywood Forever Cemetery - Los Angeles. 3 years ago today, Anderson-Abruzzo Albuquerque International Balloon Museum - Albuquerque - New Mexico. 4 years ago today, How to Eat a Pomegranate. 5 years ago today, Bollini's Pizzeria Napolitana - Monterey Park. Sorry, I deleted my comment as I forgot to write one work. What a wonderful trip it must have been! I flew many, many times over Iceland but never stopped. It was! I had a great time, but would have loved to see more of Reykjavik. I ended up spending most of the two days I was there out on tours so no chance to see the city. You can layover in Reykjavik for free if you fly Icelandair! Guess Where I'm Wandering 5?